Author: Jeffrey Heath. Series edited by: Harry Stroomer. 12 pp. Roman, 164 pp. The texts of the present volume are annotated with numeral notes and facing English translation. Texts 1-21 are from a single dialogue taped in 2000 between two men of different clans of the important Kal Ansar confederation in the Timbuktu region (abbreviation T-ka). Texts 22-25 are quite different in every way. The dialect is that of Kidal (K), the speakers are urban women (having moved from Kidal to Gao), and the texts are saucy and rather tongue-in-cheek. The women appear to be role-playing at times. While the T-ka texts are Virgilian in flavor, there are hints of Aristophanes in the Kidal texts. 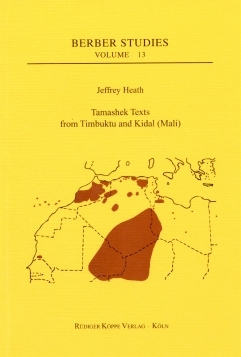 Non-Malian Tuareg texts can be found in Aghali-Zakara & Drouin (1979), Chaker et al. (eds.) (1984), Khamidoun (1976), and Louali-Raynal et al. (1997). In addition to this, our programme offers a Tamasheq study book and a Tamasheq-English dictionary.